When I grow up, I think I want to be a writer. As well as writing on my personal blog, I also write for two other ventures. I do theatre reviewing for the delightfully honest and unpretentious theatre blog Everything Theatre and write a regular articles and pub talk contributions for the biggest monthly West Ham magazine, BlowingBubbles. 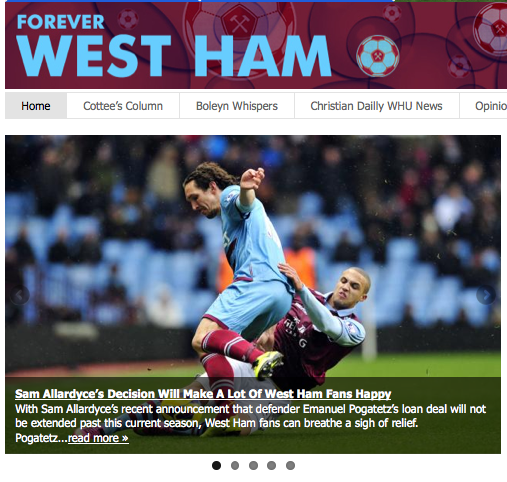 Previously I was an ‘Opinion From The Stands’ writer for an excellent unofficial West Ham United website – Forever West Ham and the all-female LaFootyettes blog. Everything Theatre – back catalogue here. Guest post for UniLad Football – also here. Click here to read my other pieces for LaFootyettes. You can find my back catalog here.